Over the course of the next decade, the demand for competent, trained medical assistants will continue to increase-driven by an aging population and increased access to preventive care due to the Affordable Care Act. This national trend holds true in Iowa with over 23 percent job growth predicted in the state through 2012. In one to two years, Iowa students can earn a certificate, diploma or associate degree in medical assisting. Programs in Iowa include valuable externship experiences that provide supervised, hands-on practice. In Iowa, medical assistants earn a median hourly wage that is over $2 higher than the average of all healthcare support positions in the state. If you want to learn more about becoming a medical assistant in Iowa, read on to find out about certifications, schools and salary information. Medical assisting is a great field to get into if helping and caring for others is your passion. Medical assistants take on some basic patient care, including giving injections and medications, measuring vital signs and recording patient histories. They go to work in health care facilities, hospitals and physician offices, where duties may vary. To earn a degree or certificate in medical assisting, you must first find the right program for your needs and schedule. 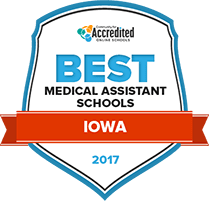 We’ve done the research for you, looking at student-to-teacher ratios, available programs, student services, tuition rates and more to bring you our 2017 Best Medical Assisting Schools in Iowa below. Iowa Lakes Community College offers a medical assisting program that provides students with the knowledge necessary to become a multi-skilled worker in a medical office or clinic. On top of learning the administrative functions that keep a medical office running properly, students will also develop an understanding of human anatomy and physiology that will allow them to assist with basic and advanced medical examinations. One of Iowa Lakes Community College’s primary goals is to foster inclusivity in its community, which is why it regularly hosts a variety of on-campus events to allow students from all backgrounds to get to know one another. Kirkwood Community College offers a medical assisting diploma that can be completed in just one year, giving students the chance to begin a career as a medical assistant without spending too much time in school. Graduates from this program will have the skills necessary to achieve an entry-level position in a medical office or clinic, including the ability to process medical billing and insurance paperwork, perform basic patient examinations, and have an extensive understanding of medical terminology. Kirkwood also offers a large selection of its courses in online formats, which are largely beneficial for students who are too busy to attend class in person. The associate of applied science degree in medical assisting available at Iowa Central Community College is perfect for any student who is interested in beginning a career in the administrative side of the medical industry. With the knowledge students will accrue throughout this program, they will be eligible for entry-level employment in a medical-based setting. Iowa Central seeks to make the education it provides available to any interested student, which is why they offer several courses in online sections. Iowa Central also provides its students with career services that help to guarantee post-graduation employment. As medical assisting programs admissions requirements and tuition costs vary, it's important for prospective students to research their options. Associate's degree programs may include more general education courses, while certificate programs might not offer the same level of supervised practicum experiences. Our search tool can help you find the school that meets your needs and your budget. How does Iowa define "medical assistant?" In Iowa, medical assistants are allied health professionals working mainly in outpatient settings such as clinics and practitioner's offices. Medical assistants can perform administrative duties including scheduling and billing. Additionally, medical assistants may assist with taking a patient's medical history and vital statistics. If properly trained and supervised, they may perform other specific clinical tasks including venipuncture and intramuscular, intradermal and subcutaneous injections such as immunizations. While certification is not required for medical assistants in Iowa, some employers require the nationally recognized Certified Medical Assistant credential within one year of graduation. There are several paths to medical assistant certification. Some certifying agencies require work experience or education in addition to an examination. The American Association of Medical Assistants, the credentialing body for Certified Medical Assistants (CMA), will only accept graduates of medical assisting programs accredited by the Commission on Accreditation of Allied Health Education Programs (CAAHEP) or Accrediting Bureau of Health Education Schools (ABHES). While the Certified Medical Assistant is the most commonly recognized credential, there are several others. Is a formal education and/or training required? While formal training may not be required, it is clearly preferred by employers. Both diploma and associate degree medical assistant programs prepare students for entry-level positions in medical assisting. Often, healthcare providers in Iowa may require medical assistants to have training in certain procedures such as CPR. Employers may require criminal background checks as well as drug testing. Are there tasks outside the scope of medical assistants in Iowa? Additionally, medical assistants may not refer to themselves as nurse, office nurse or doctor. Medical Assistant salaries in Iowa track closely to the national average. Salaries for medical assistants can vary depending on where you live in Iowa. The highest median annual wages are found in Iowa City. Generally speaking, medical assistants earn more in metropolitan rather than the rural areas. The area of Davenport, Moline and Rock Island proves the exception to this rule. With an annual median wage of $26,730, or just $12.85 per hour, it has the lowest of areas in Iowa profiled by the Bureau of Labor Statistics. 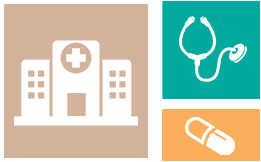 With improved access to medical care for many patients, medical practitioners and clinics will see a real uptick in demand for their services. As a result, they will need to rely more heavily upon well-trained medical assistants to keep their offices running smoothly. Iowa community, private and technical schools offer a variety of medical assisting programs. Prospective students can find diploma and certificate programs as well as programs that lead to an associate degree in medical assisting. Look for a school that is accredited and offers students an opportunity to put their skills into practice through an externship or practicum program. Here are a few selected schools to help you start your search. The AAMA is an education, certification, credentialing, and advocacy organization representing medical assistants nationally. This professional organization helps medical office managers stay up-to-date and in compliance as they manage or perform the day-to-day tasks that support a medical practice. IMS is a professional education and advocacy organization for healthcare providers in Iowa. This trade group offers certification, continuing education and networking opportunities with chapters throughout the state of Iowa. This website provides salary information as well as job listings in Iowa.